Congratulations to our Managing Partner, Steven M. Cockriel, on being named to the 2018 Super Lawyers “Top 50” List for St. Louis. This list recognizes the top 50 lawyers in any specialty in the St. Louis area, based on peer-review rankings. Cockriel & Christofferson, LLC is proud to announce that its attorneys have again been recognized for excellence by Best Lawyers for 2019. Steven M. Cockriel and Philip J. Christofferson are both listed in the fields of Construction Law and Litigation-Construction. This is Steve’s 11th consecutive Best Lawyers award, and Phil’s 9th consecutive award. Congratulations! We are pleased to announce that Cockriel & Christofferson has once again received a Tier 1 ranking in the fields of Construction Law and Litigation – Construction in the 2018 Edition of U.S. News and World Report’s “Best Law Firms.” C&C is one of only four St. Louis area law firms to be recognized as a Tier 1 firm in both construction-related fields. Once again, all three of Cockriel & Christofferson’s attorneys have been honored by Missouri and Kansas Super Lawyers for 2018. Steven M. Cockriel and Philip J. Christofferson were named as Super Lawyers in Construction Litigation, and Michael J. Rolwes was again named a “Rising Star” in Construction Litigation. Congratulations to all of our attorneys! 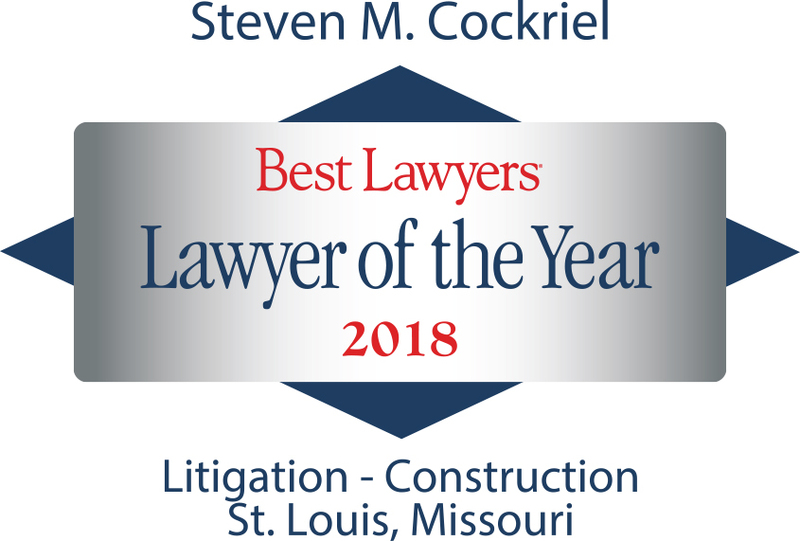 Congratulations to our Managing Partner, Steven M. Cockriel, on being named the 2018 St. Louis Lawyer of the Year in Litigation – Construction by Best Lawyers. This is Steve’s second award in this category; he was also Lawyer of the Year in 2012. Best Lawyers is the oldest and most respected peer-review publication in the legal profession, and designates a single lawyer in each speciality in each community. Steve has been listed in Best Lawyers every year since 2007. C&C member Philip J. Christofferson has been named the 2015 St. Louis Lawyer of the Year in Litigation – Construction by Best Lawyers. This is Phil’s second Lawyer of the Year accolade – he was also the 2013 St. Louis Lawyer of the Year in Construction Law. Best Lawyers is the oldest and most respected peer-review publication in the legal profession, and designates a single lawyer in each specialty in each community. Phil has been listed in Best Lawyers every year since 2010. Congratulations! Our firm has extensive experience litigating, arbitrating and mediating all forms of construction disputes. Our clients rely on us for legal advice in construction contract disputes, defective design and construction claims, payment disputes, and other construction matters. We have prosecuted and defended against mechanic’s liens, ranging from $500 to more than $1,000,000. Our talented attorneys have honed their skills in Missouri and Illinois state courts, federal court and in private mediation and arbitration proceedings. We have litigated projects ranging from defense of a subconsulting engineer in Metrolink’s $100 million lawsuit against the Cross-County Extension’s designers in 2007, to representing builders and owners in small residential construction defect cases. We have provided counsel on projects ranging from sanitary landfill construction and power plant development, to commercial shopping center and residential subdivision development, to custom home construction and account collection for small contractors. Our clients tend to be small to medium-sized companies, including mom and pop shops — clients who appreciate our personalized service, attention to detail and high ethical standards, for which our firm is AV® Preeminent™ Peer Review Rated by Martindale-Hubbell®. Cockriel & Christofferson, LLC is conveniently located in St. Louis and serves clients throughout Missouri and Illinois. To schedule an appointment, call 314.821.4200 or contact us online. For the second year in a row, a Cockriel & Christofferson attorney has been named a St. Louis Lawyer of the Year by Best Lawyers. Congratulations to Philip J. Christofferson, who was named the 2013 St. Louis Construction Law Lawyer of the Year by Best Lawyers. Best Lawyers is the oldest and most respected peer-review publication in the legal profession, and designates a single lawyer in each speciality in each community. Phil has been listed in Best Lawyers every year since 2010. 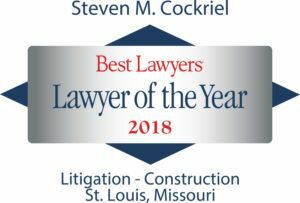 Congratulations to our Managing Member, Steven M. Cockriel, who was named the 2012 St. Louis Litigation-Construction Lawyer of the Year by Best Lawyers. Best Lawyers is the oldest and most respected peer-review publication in the legal profession, and designates a single lawyer in each speciality in each community. Steve has been listed in Best Lawyers every year since 2007.